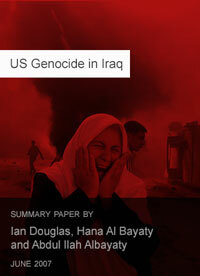 [pullquote align=”right”] Sectarianism and apartheid cannot break the geopolitical unity of Iraq, which is a historical, social, economic and cultural reality [/pullquote] But these walls — vast concrete blocks that the US occupation is manufacturing at a rate of 2000 per week — continue to be constructed and have nothing to do with protection and everything to do with instituting a sectarian division of Baghdad ahead of plans to divide the whole of Iraq along sectarian lines. The option of general imprisonment is not a new strategy, nor limited to Al-Adhamiyah. Al-Dawra, Al-Ghazaliyah, Al-Amiriya, Al-Amel and Al-Adl — all in Baghdad — are among 10-30 other Baghdad neighbourhoods slated to be sealed to the outside world, joining Tel Afar, Fallujah, Al-Qaim, Samarra, Yathreb, Al-Ratba, Haditha, Hit and Al Khalidiyah as besieged “gated communities”, leaving hundreds of thousands of people under de facto house arrest and whole cities, towns and districts in de facto solitary confinement. The principle of self-determination of peoples is enshrined in the United Nations Charter and reaffirmed by UN General Assembly Resolution 2625 (XXV) of 24 October 1970, pursuant to which “Every State has the duty to refrain from any forcible action which deprives peoples referred to (in that resolution) … of their right to self-determination.” Article 1 common to the International Covenant on Economic, Social and Cultural Rights and the International Covenant on Civil and Political Rights reaffirms the right of all peoples to self-determination, and lays upon state parties the obligation to promote the realisation of that right and to respect it, in conformity with the provisions of the UN Charter. On the prohibition of collective punishment, see Article 50 of The Hague IV Regulations, 1907: “No general penalty, pecuniary or otherwise, shall be inflicted upon the population on account of the acts of individuals for which they cannot be regarded as jointly and severally responsible”; Article 33, The Fourth Geneva Convention, 1949: “Collective penalties and likewise all measures of intimidation or of terrorism are prohibited”; and Article 51, the 1st Additional Protocol to the Geneva Conventions, 1977.